Organic kiwis are now available widely in the United States, and conventional ones are virtually everywhere. Only in remote places in Kansas and other mid-western states have I been unable to find them. Kiwis travel well, so if you're going somewhere remote, take some with you. They are easy to squash, but they don't ripen too fast, so you can purchase them very firm. Firm kiwis will keep well over a week without going too soft (at temperatures below 80 degrees F). Because they do well without refrigeration, I enjoy ordering organic kiwis by the box through my local co-op market. I've seen many creative descriptions. Such as, "The fruit has a sweet taste, similar to a mixture of banana, pineapple and strawberry," and "They have a kinda melon taste with strawberry mixed in," and "Tastes like a cross between a strawberry, banana and a nectarine." In my own opinion, it is similar in texture to a dragonfruit. The flavor, when somewhat under-ripe (the way I like them best), is somewhat like a mild lemon crossed with a banana and a small yellow mango. When they are ripe or over-ripe they taste more melon-like. Most people seem to like them either sour (not quite ripe) or sweet (ripe and soft), but not the other way. When trying one for the first time I recommend trying both a firm kiwi and a soft one. The flavor change is significant. The difference this quick vigorous process makes is very significant. The texture becomes more like an apple skin. It is even visible as seen in the photos below. Scrubbing each plane of the kiwi takes very little time — roughly amounting to three seconds per plane, which is 18 seconds per kiwi. These fast firm motions take off everything, especially if you are patient enough to scrub even longer. You don't have to buy a special brush. Use any firm-bristle brush you choose: a finger-nail brush will work well. I keep a dish-scrubbing brush aside near the sink for the purpose of scrubbing fruits and vegetables. A series of studies published by the Archives of Ophthalmology have shown that consuming three or more servings of fruit per day (including kiwi fruits) can reduce the risk of developing an eye-related disease called ARMD (the primary cause of vision impairment in adults) by 36%, if compared to people who only consume one-and-a-half servings of fruit per day. This is attributed to the phytochemical lutein found in kiwis. While kiwis are not special in their fiber content (almost all fruits have great fiber content), the benefits of fiber should not be over looked. Dietary fiber helps improve diseases such as diabetes and colon cancer. Fiber slows the absorbtion of sugar, keeping the sugar levels in the body consistent. Fiber binds to toxic compounds in the colon and helps us expel them. Fiber has been proven to reduce cholesterol levels, improving the conditions of patients with cardiovascular diseases and lowering the probability of heart attacks. Animal products such as meat, milk and cheese have little to no fiber at all. Juices and drinks do not have fiber. The fiber in cooked food is altered and not as effective at helping things move through the colon. 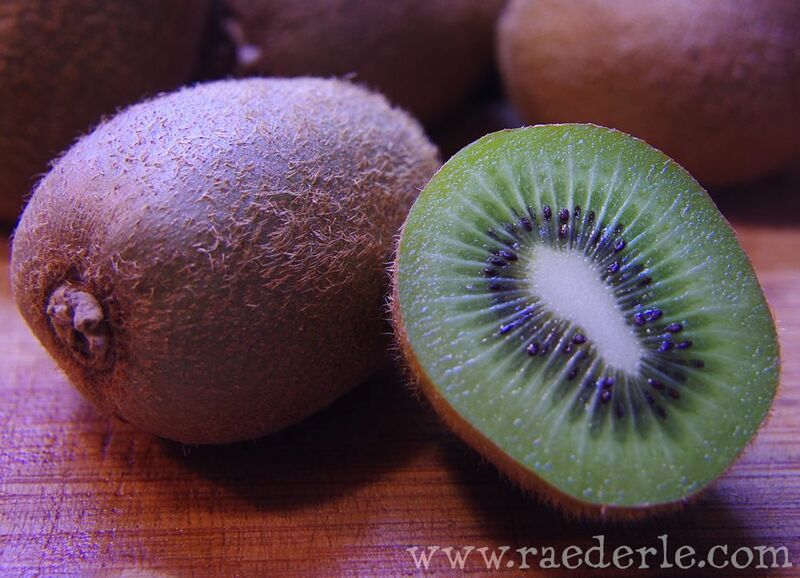 The best fiber comes from raw fruits and vegetbales, such as the kiwi. Researchers at South Korea’s Seoul National University administered kiwifruit extract to mice that were later exposed to allergens, then monitored for roughly three weeks. Compared to a control (placebo) group, the kiwi-fed mice enjoyed a 47 percent decline in asthmatic symptoms – plus a 48 percent reduction in white blood cell counts (which marshal in excess among asthmatic and allergy patients). Kiwi’s powerful enzyme – actinidin – may play a role. Studies in Italy performed on 6 and 7 year old children have demonstrated health benefits to the respiratory tract. Children that were fed 5 to 7 portions a week of citrus and kiwi had 44% less wheezing compared to children eating less than one portion per week. Shortness of breath was reduced by 32%, night time coughing by 27%, severe wheezing by 41%, chronic coughing by 25%, and running nose by 28%. Some attribue these benefits to the "flavonoids" present in the fruit which protect our cells from oxidative damage. Below is a Food Fight chart where Kiwis, Oranges and Pears duke it out. Kiwis take the cake in Vitamin C and Pears pretty much just get their you-know-whats kicked. Feel free to pin the above image to your pinboards, share on facebook, and tweet about it on twitter. Let's set the record straight once and for all: Oranges are great for B-vitamins and Calcium, but they are inferior to Kiwi fruits on many scores, such as Vitamin C, Vitamin E and Iron. 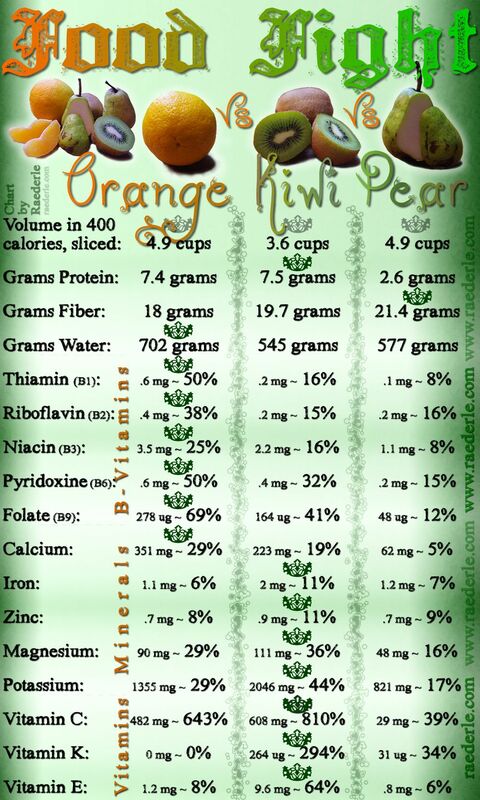 Both kiwis and oranges are somewhat unusual among fruits for having a positive calcium to phosphorus ratio. Kiwis grow on vines. The typical kiwis seen in U.S. grocery stores are the green kiwi fruit and require a warm growing climate such as California or New Zealand. However, not all kiwi varieties require a warm climate. The remarkable hardy kiwi vines can be grown in regions that get quite cold. The Actinidia Kolomikta is also called Arctic Beauty Kiwi, and can survive in areas as cold as zone 3. The vine grows about ten feet tall and three feet wide, sporting a lovely varied foliage with green and pink leaves. The vine has whitish-yellow fragrant flowers in spring. Truly though, what sets this northern wonder apart is its sizable oblong leaves which are splashed with bright white and pink swaths along its edges. The effect is pronounced and stunning, even from a distance. The colorful leaves are more varied when planted in full sun, but the vine can survive in a shaded location. The fruit is much smaller than those that you see in the store. They average at the size of grapes. The hardiest type is the Actinidia Kolomikata which does not need winter protection. The skin of the fruit is hairless: no scrubbing required. The flavor is similar, perhaps sweeter. Plants should start to bear fruit in about one to two years after planting, and once established they can live for fifty years or more. Be sure to purchase a female plant as they are the only ones who can produce the fruit. You will also need the male plant to pollinate. Hardy kiwi vines require at least one male pollinator for every eight females. Wind is the primary pollinator, so plant the male in the direction of the prevailing wind. Different cultivars bloom at different times; it is necessary to make sure the male and female bloom times overlap. Hardy kiwis are very vigorous vines once they are established. Plant them with an adequately large structure to grow on. They can be finicky when young, so start with larger plants or pay them particular attention in the first couple years. Hardy kiwi vines will grow in partial shade but produce better when in full sun. They tolerate a range of soils as long as there is drainage. For best growth and production, the vines appreciate regular and thorough watering. Hardy kiwis are harvested in the fall when they begin to soften and sweeten. It can take up to eight years before hardy kiwis begin to fruit. Proper pruning and care can reduce this time to as little as three years. Once started, hardy kiwis can be prolific, producing up to 100 pounds of fruit from a single plant. Although Kiwifruit has been known for more than 700 years, it has only been available in the United States since the 1960s. The history of the Kiwifruit began in the Yang-tse River Valley in China, known as “Yangtao.” The fruit Yangtao was considered a delicacy by the court of the great Khans who cherished its flavor and emerald color. Today, few in America call it the "kiwifruit" anymore. It is simply a kiwi, sharing its name with New Zealand's national bird. 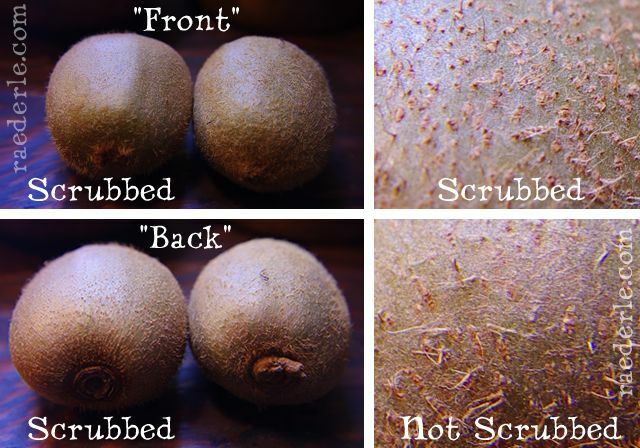 The brown, fuzzy kiwi fruits used to be found wild. The vines would be seen wrapped around trees. In their natural habitat, the vines climb large trees up to 60 feet tall in the forests of China. You can grow them anywhere, just buy the right variety. Kiwis are good for an array of conditions such as diabetes, asthma, colon cancer, and vision problems. Kiwis should be the new poster child for Vitamin C (not oranges). Kiwis are a great travel food, and excellent for bulk purchase. Kiwis are an appropriate fruit to eat in quantity on a regular basis. Thanks for stopping by and checking this out. Come back again soon. PS: If you're starting to think that kiwis are so great that perhaps you could just live off of them, I'd like to tell you that you're nearly correct, but not quite. For details on that, read my article on The Fruitarian Diet.